I’ve become more and more reluctant to write early reviews of pens – mostly because a thorough review needs thorough use. I’ve only had the TWSBI pen for a short period of time, but I’m so positively surprised that I want to share some thoughts. The TWSBI has in a very short time become very popular among fountain pen people.You can buy it straight from the source at Ebay for $39 + a few dollars in shipping costs and I was curious to know what the fuss is all about. And now I know. It is made to function and comes delivered with a manual for disassembly. It has a smooth operating piston that holds a big chunk of ink. The nib is an EF and it is smooth and at par with nibs made of gold that is mounted on pens many times more expensive. Made to do a good writing job. It is solidly put together and nice to hold. The design is simple, without bling, but with an attention to detail that makes it stylish in a way that pleases us who like clean and unadorned. The EF is more of a F and lays down a nice not-too-wet-not-too-dry line. Nothing (so far) is flimsy. Unlike many expensive pens it is made to be used and seems to be made to put up with a lot of abuse. Can you hear that I am tired of overpriced, expensive pens that doesn’t fulfill the expectation that the price tag gives rise to and which often bears witness of poor and insufficient quality control? Well, I am. I’ve tried far too many modern pens with hefty (in my eyes) price tags which are way too overpriced. Many fountain pen manufacturers also seem to focus more and more on the more “higher” segments with pens that are made as collectibles and not for use and thus it is refreshing with a pen as the TWSBI that expressly seeks to deliver a functional, well designed pen with a piston filler for a very reasonable price and that it seems to keep these promises. It has already made it into my regular stable of daily users. I’ll follow up with a real thorough review when I have used it a little longer. But so far it seems unlikely that it will disappoint. TWSBI, a set on Flickr. 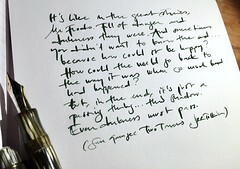 This entry was posted in fountain pens, pens, twsbi and tagged fountain pens, pens, review, twsbi. Bookmark the permalink. My 540 leaks from the nib area. Took it apart and siliconed the piston. Took nib out and no improvement. Guessing the nib seal. Liked it though. Was fun while it lasted. Trying to get hold of them to get an exchange. Can’t lose too much sleep over 50.00$ any one else have a leaking 540?? I’ve had a 540 for a month or so and use it every day. I still prefer my Montblac Meisterstuck No 149 but for less than 50 $ the 540 is a beauty. No problems and I love it. Mine cracked after just a few hours of use ( the piece that joins the piston to the section). Then the 1.3 AND 1.5 piston version leaked even after repeated efforts to solve the problem according to the instructions provided by the manufacturer. He finally acknowledge the 1.5 piston also had an issue. Then the lower part of the section developed two hairlines. The threads of the cap are very tight and it is not practical for those that need to have it ready to write or close the pen fast. The polycarbonate material used cannot be cleaned into an UltraSound machine or it will ruin the hard coating and even the material itself. The finishing is not bad but in the range of a Lamy Vista, nothing more. The worst by far is the nib; nailish, inconspicuous at best when not poor. The 530 initial version holds 1/1.1 ml of ink. The current 540, 1.5ml. An international long cartridge holds 1.5 ml. They are better pens for the money out there, but as an experimental pen that comes in translucent colours and screams out for an urgent nib change it’s a market success. I enjoyed my first TWSBI so much that I traded for another. Now I have a F and M…both are always in rotation. And I can say that I have not been gentle with them like I am with my other pens. You can’t tell that they’ve been knocked off the couch onto the wood floors numerous times by my kiddies, dropped, thrown in the bottom of diaper bags and handbags, etc. When the new models come out, especially the Vac 700, I will have a couple of each as well. It was, and still is, a great project to follow and be a part of on FPN. I love the look of it! I looked on ebay and could not find a TWSBI for cheaper then $59.99 plus shipping and none of them had the cool look of yours. Do you know anywhere else that sells them? Thanks for your great reviews! I was going to say; the pen looks like its taken inspiration from Stipula. If your impressions remain positive after a few months, I might order one from The Writing Desk about Christmas! Nice review. Mine weighs (capped, but empty) 7/8 ounce or 0.055 lbs. The replacement seal was added in my order, and I replaced the original which did leak, and the new one leaks also. However; it doesn’t really hurt anything… It is a great pen for the price. That fact that YOU have an initially positive response gives me pause and I look forward to hearing how you feel about after a year or so. I’ve a hard time believing it is a great as everyone says. And so I feel it is a must see for one’s self sort of pen! Some day I will. I had a hard time believing that too, but at last the curiosity took overhand and I definitely don’t regret it. The nib is as good as Stipula’s steel nibs and the construction is way better than the Stipula Ventidue that sold for around 3-4 times more. Better than Levenger too, I think (tried their pens in Boston). That is telling when you say better constructed than the Ventidue. I heard these weighed 27grams yet don’t know if that’s without the cap. Any clue for moi? 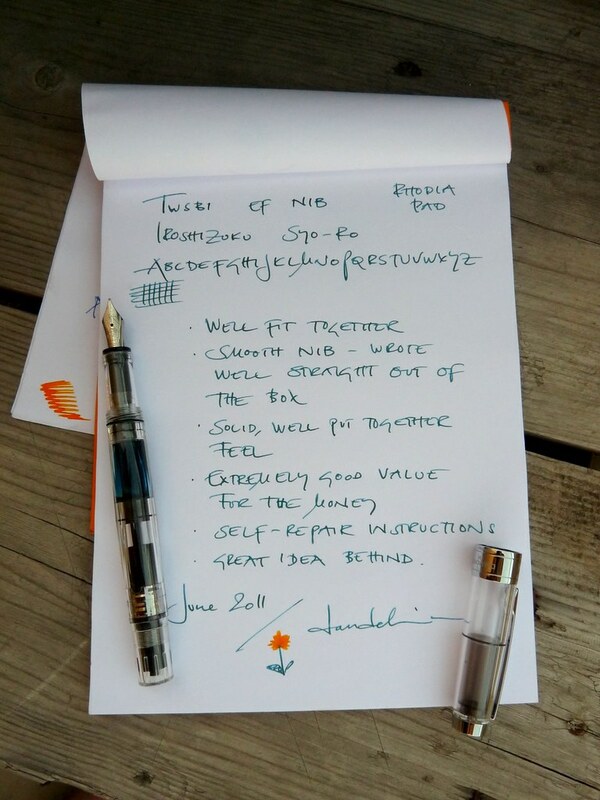 Good to hear that you like the TWSBI….been tempted to try one, given the price…. Is the nib (steel I assume…) very firm? It is firm, but not a numb nail. I don’t know how to describe the difference, but I think it has a tactile feel to it that, for instance, Lamy Safari doesn’t have. Considered the price – no point in waiting for it to become more expensive. A great allround pen! I love my TWSBI. I wish it was avaialble with a cursive italic – I may purchase one and have it shipped to Pendleton of FPN for a Pendleton Point. I have an extra fine nib, and it is super smooth right out of the box. For anyone that is not aware, you can remove and change the nib. I think the current price for just the nib is about $18. It does hold a ton of ink, which is great – unless you like XF nibs and change colours frequently. A great writing pen. I also want to mention, I bought one of the first ones avaialble, and the company has since changed the piston design to correct some occasional leaking issues some people experienced. I received an e-mail letting me know this, and a new piston in the mail shortly after. It is not often you find such excellent customer service. Let alone on a superbly performing $40 pen. Mine is due to go back into rotation shortly. That – a CI twsbi- would be much interesting. 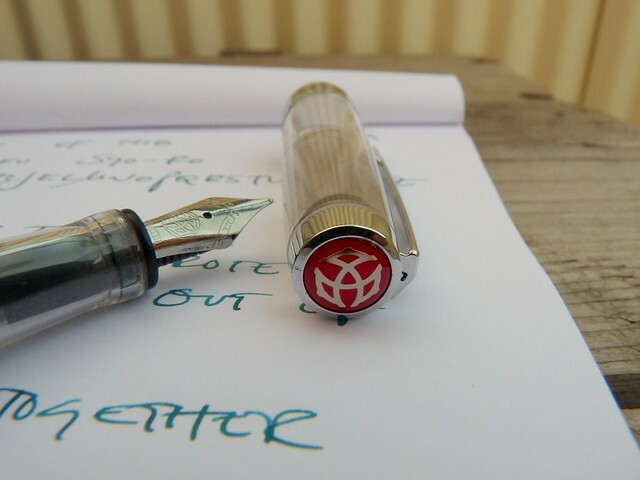 I very much agree with you about TWSBI. I’ve had mine since Christmas and it completely out-performs my much more expensive pens. It is more reliable, by far, as I’ve found my pricey pens to be fussy. My TWSBI writes perfectly, every time, with all my inks, and even after sitting around a week unused. I have a fine nib and I’d say it’s a fairly true fine with most inks. A really wet ink will make it feel a bit more medium, but that speaks to the ink. I am pleased to read that you like the TWSBI. I too am very, very happy with mine. Have used it since last March and it continues to be a star in my weekly rotation of fountain pens. Such good, well-rounded work in the design and manufacture. Thanks for your preliminary review and the comment about the TWSBI nib size. I’ve been wanting to get one of these myself but haven’t been able to decide if I want the fine or the medium nib. I’ll be looking forward to the full review in the future.